Following Rosie's funeral service please join her family from 4-7pm for a Reception in the Life Story Center at the Betzler Life Story Funeral Home; 6080 Stadium Drive, Kalamazoo to share food and stories. This time of sharing food and stories will be held in the Life Story Center at the funeral home following Rosie's funeral service. Truly beautiful on the inside and out, Rosalyn “Rosie” Hogan was a blessing to all who were near. She was a longtime resident of the community she loved, and her life exemplified what it means to be a loving, caring person. 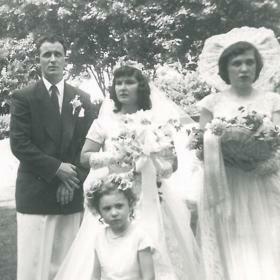 Rosie was deeply devoted to her loved ones, and there was nothing she treasured more than being surrounded by their love. She had a contagious laughter, and once she got everyone around her laughing along there were often tears amidst the laughter. Life will never be the same without Rosie here, but she leaves behind a brightly colored mosaic of memories that her loved ones will forever cherish. The 1930s were some of the most trying days we have faced as a nation as the Great Depression covered our nation and much of the world like a wet blanket. With a soaring unemployment rate, there were few American families who didn’t feel the strain. Despite the trials around them, Douglas and Arlene (Clute) O’Leary were filled with great joy to announce the birth of the baby girl they named Rosalyn Marie on September 30, 1930. Joined in her family by her older brother, Charles, and her younger brother, Don, she was a young girl of her generation. Rosie’s father was a business owner in Marshall and later in life became the mayor, while her mother was a homemaker. She and her siblings loved going to Grandma and Grandpa Clute's to sing hymns around the piano on Sunday nights. Rosie also liked playing dress-up, having tea parties, and playing games like Monopoly, Chinese Checkers, and Flinch with no jokers. From the time she was a young girl Rosie was a bustle of activity. She and her mother loved taking the train to Chicago for shopping and tea, and the family enjoyed decorating their home and their grandparents’ home for Christmas. As we entered WWII in 1941, Rosie’s brother Chuck was called to serve in the Air Force. They were always so glad to receive a letter from him, and they also faced blackouts as well as paper and scrap metal drives. 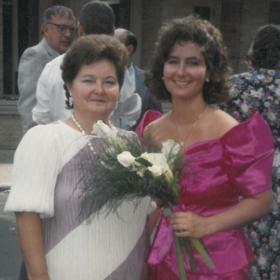 Rosie attended Pierce Elementary School and Marshall High School, where she was involved in organizing the prom. After graduating from Marshall High School in 1948, she went on to Western Michigan University where she was a member of the Sigma Tau Chi business fraternity. A good student, Rosie received her bachelor’s degree from WMU in 1952 and was also a longtime member of the Alpha Chi Omega Sorority. As a young woman, she worked as a private secretary at the Kalamazoo Vegetable Parchment Company. New and exciting changes were in store for Rosie when she met the young man of her dreams. His name was Gerald F. “Jerry” Hogan, and they met while at Western. They dated throughout college, and with a desire to establish a life together they were married on June 20, 1953, at the First Baptist Church in Kalamazoo. They honeymooned through Colorado for two weeks and then returned to Michigan to establish their first home near Gun Lake. Together they welcomed three children including Kerry, Mike, and Linda into their hearts and home. Rosie was an amazing mother who was patient, kind, and sweet, and she loved cheering her children on at all their sporting events including softball, basketball, football, and baseball. First Presbyterian Church was another important part of Rosie’s life. She participated in Church Guild and was a Deacon. With the family, she especially enjoyed attending the Christmas Vespers, partaking in cookies with hot chocolate, and walking through Bronson Park to see the Christmas lights afterwards.  In addition to caring for her family, Rosie founded the Star Premium Budget Company. This was a finance company to finance insurance premiums and was a part of Jerry’s insurance company, Hogan Insurance which is now run by son Michael and grandson Michael II, as a three-generation owned family business. Rosie successfully managed Star Premium for many years while raising the children and keeping the home for her family. They also had pets that were important members of their family including their cats, Rusty and Duffy, and their dogs, Sparky, Chip, and Zeke. So many of Rosie’s best memories were made with her family. Her family had a cottage up North at Higgins Lake, and they spent a lot of time as families going to the cottage. Rosie also loved spending time with her family there, although she didn’t love the outhouse too much. There were fun times spent at “the cut,” sailboating, telling stories around the campfire, blueberry picking, horseback riding, and just spending time together. Rosie was thrilled to become a grandmother, and she looked forward to annual family retreats with her children and grandchildren. 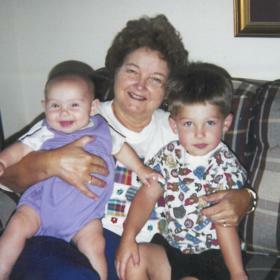 She loved babysitting for her grandchildren as well as celebrating various holidays together including going trick or treating with them as well as watching them open gifts at Linda’s on Christmas morning. 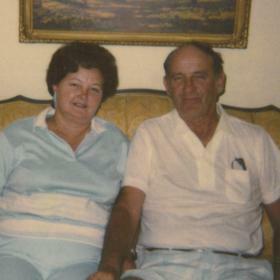 Rosie loved family cookouts at Mike’s house that included swimming, eating, and watching Tigers games together. Rosie treasured the annual trips deemed “Family Vacations” with Kerry, Laurie, Dayna, Allie, Mike, Cathy, Michael, Dave, Linda, Jacob, and Olivia. Each of the kids took turns picking the destination and over the years they went to places like Chicago, Traverse City, Higgins Lake, Ludington, Frankenmuth, Michillinda Lodge, Double JJ Ranch, and Cedar Point where she rode the rides well into her 70s - and loved it! Life was forever changed for Rosie when her beloved Jerry died in 1994. Although she was deeply saddened without him, she did her best to continue living life to the fullest. Rosie spent many winters at her condo in Bradenton, Florida, where she enjoyed the company of her brother, Don, and sister-in-law, Jerriene, as well as her best friend, Pat Markle. With her family and friends, she also traveled to Egypt, Scotland, Aruba, Mexico, Ireland, and many other memorable destinations. She cherished the memories made on her trip to Ireland with Jerry, Kerry, and Laurie. Over the years Rosie made it to all 50 states, which was something she had on her bucket list. She particularly enjoyed going on cruises and was able to do this during her later years. Rosie was instrumental in her community, having established the Jerry Hogan Endowment Fund, the WMU Baseball Scholarship Fund, and was the benefactor to build the Jerry Hogan Memorial Hyames Baseball Field Scoreboard as she was a longtime supporter of WMU baseball.. She was also a volunteer at the Kalamazoo Gospel Mission. Rosie enjoyed shows at Miller Auditorium and volunteered there as an usher for shows and musicals during her retirement years. An animal lover, she enjoyed the companionship of her cat, Corky, after Jerry died. All who knew Rosalyn “Rosie” Hogan would agree that no one met her and left unchanged. She was kind, compassionate, and generous beyond compare. Rosie had a contagious zest for life and an enduring love for her family that was such a gift to her loved ones. Deeply loved, she will be forever missed. 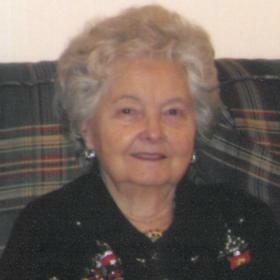 Rosalyn “Rosie” Hogan, of Portage, passed away March 29, 2018. Rosie’s family includes her three children: Linda (Dave) Larkin, Kerry (Laurie McLean) Hogan-McLean, and Michael (Cathy) Hogan; five grandchildren: Jacob Larkin, Olivia Larkin, Allie Hogan-McLean, Dayna (Josh) Browning, and Michael Hogan II; one great-grandchild, Luke Browning; brother, Don (Jerrine) O’Leary; and her sister-in-law, Beulah O’Leary. Rosie was preceded in death by her parents; husband, Jerry Hogan; and brother, Charles O’Leary. Services will be held at 2:00 p.m. on Thursday, April 12 at the First Presbyterian Church; 321 W. South Street, Kalamazoo. A reception will follow from 4:00-7:00 p.m. in the Life Story Center at the Betzler Life Story Funeral Home; 6080 Stadium Drive, Kalamazoo (269-375-2900). 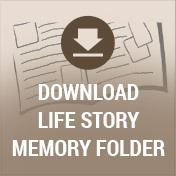 Please visit Rosie’s personal memory page at www.BetzlerLifeStoryFuneralHome.com where you can share a favorite memory or photo and sign her online guestbook before coming to the funeral home. Memorial Contributions may be made to the Alzheimer’s Foundation, First Presbyterian Church, or the American Cancer Society.